1. Record everything at 24 bit, even if the signal comes at 16 bit from synths (select the project resolution at 24 bit). Some synths output is at 16, but that’s OK, just do them at 24. 2. When recording a track, have a good signal strength (target peaks at -2 to -4 dB). As most of the sounds you’re using are compressed, if they’re recorded at a low level, I have to use compression (limiting) again to raise them, which results in loss of quality and shine. Normalizing may look OK, but it is a bad thing to use; no benefit there. Another reason – if I feel that the track benefits from going out through a preamp/EQ/Compressor, the lower the signal the bigger the noise floor, and the final mix loses punch. 3. If tracks are side-chained, please also send them clean -before side-chaining. While they are all side-chained with the same attack/release, sonically they can clash as the way the compression works over the frequency spectrum, and the final sound may not support properly the groove. Indicate if you can the attack and release if you want to get very specific about the groove, so I can use the same attack, but probably I will have to work around the release. 4. Use mono tracks as much as possible – especially kick, snare, bass, vocals. The synth sound integrates effects, so it’s OK to have them in stereo (like ping-pong delay), but I can create a much better stereo image if I process it during mixing, so it is better to have both the stereo, and then just the mono track from the main output of the synth. A stereo track sounds bigger in isolation, but if every track is stereo and sounds big, then the mix is toocrowded, looses distinction, and there is no real space for communication between sounds. An exception from this would be the arpeggio’s with all kind of delays – as you want something specific. 5. Use reverbs on synth pads only sparingly, and only if you feel you need them to be a part of the sound, though I definitely don’t recommend it. I judge and add reverbs only toward the final stage at mixing, when I have to create the space in between instruments and underline the effects for each type of music in order to help deliver the sound. On arpeggio’s, if you decide to apply reverb, use different reverbs with different settings, create some space between them (in case you want to incorporate the reverb to get a certain effect). Avoid using reverbs on arpeggios and let me do that, so I can complement the track. 6. When somebody records the vocal for you, make sure they’re doing it at 24 bit, and ask them not to use compression unless they are using a Tube-Tech CL-1B or LA-2A or something of that nature, in which case ask them to have a max of 3-5 dB compression – never more. The vocal tracks should be recorded only in mono and if they use 2 mics for the backing vocals, ask them to record each on its own mono track, not on a stereo track. 7. When you do the song definitely export the premix, it gives me a much better idea of where the song and your concept goes. I also want the export in a full stem render; essentially I want the multi-tracks, all rendered from 0.00- end of track. This is VERY important. 8. Mark down the BPM (not necessary but appreciated as it saves me a few minutes). 9. 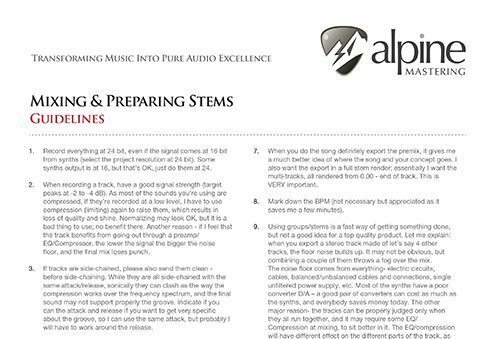 Using groups/stems is a fast way of getting something done, but not a good idea for a top quality product. Let me explain: when you export a stereo track made of let’s say 4 other tracks, the floor noise builds up. It may not be obvious, but combining a couple of them throws a fog over the mix. The noise floor comes from everything- electric circuits, cables, balanced/unbalanced cables and connections, single unfiltered power supply, etc. Most of the synths have a poor converter D/A – a good pair of converters can cost as much as the synths, and everybody saves money today. The other major reason- the tracks can be properly judged only when they all run together, and it may require some EQ/Compression at mixing, to sit better in it. The EQ/compression will have different effect on the different parts of the track, as the frequency spectrum is different and carries different amounts of energy anddifferent responses to the same process. 11. Please create subfolders, for clean tracks and the tracks the way you used them (process them) during your production. Above all else, please call me and/or email me for any issue you may have or for more help. I am extremely diligent with phone calls and emails. You have all of my contact details and I will be glad to talk with on the phone and/or email you in detail about your record(s). I am in essence here to help you with anything you may have concerning your music,so think of me as a one stop shop being there and assisting from the inception of the record to the final stages of mastering it.